Isaac Lowe’s return to the action saw him team up with one of his ring idols on a big night in Belfast. Morecambe’s former English and Commonwealth featherweight champion warmed up for his rematch with British title holder Ryan Walsh with a four-round points win over Jose Hernandez at Windsor Park. It was the Westgate Warriors’s first fight under new trainer Ben Davison who had Ricky Hatton among his support team. Davison trains both Lowe and Tyson Fury, who saw off Francesco Pianeta later in the night, at the Manchester fight great’s gym in Hyde. “Having a multi-time world champion in your corner giving you bits of advice you can’t really go wrong,” said Lowe. “I used to go and watch him at the Manchester Arena and on Saturday I reminded him about when he came to Lancaster to open some bed shop and I kept sneaking in and ended up getting about 10 gloves signed. Isaac Lowe celebrates victory in Belfast with his new team including Ricky Hatton, John Fury and Ben Davison. Lowe’s first fight since the 12-round draw with Walsh in February was designed to get him a tune-up with Davison before the rematch for the Lonsdale belt on October 27 at the Copper Box Arena in London. “I got a good four rounds in,” said the unbeaten 24-year-old. “He was a game kid who came forward and I needed it. “But when you’ve only got four rounds you can’t work on too much because it’s a fast tempo. “You haven’t really got time to go through the gears and they tend to just tuck up and survive. “But I stuck to my boxing and tried to put into practice a few things that me and Ben have been working on. 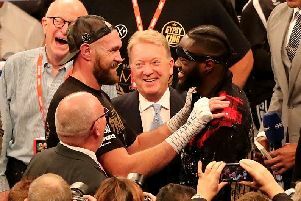 After being the first fight on the stadium bill at 4pm, Lowe later accompanied Fury to the ring for his victory that proved to be a mere appetiser for his face-off with America’s WBC world heavyweight champion Deontay Wilder ahead of their meeting in Las Vegas in November. Home favourite Carl Frampton then completed a memorable night of action by stopping Australia’s Luke Jackson in the ninth round. “It was a good experience just going over there,” said Lowe. “It wasn’t far but going away like that was another box ticked for me. “I didn’t box in front of 25,000 but I got to soak up the atmosphere. “It was still a big outdoor event for me. “Deontay Wilder was obviously in town and Tyson’s fight got announced so it was all good.